IndusInd Bank is a new generation private bank based in Mumbai and offers various types of commercial and electronic banking products & services. In India, it is the first bank among the new generation private banks. This bank was established in the year of 1994 and inaugurated in the same year by Manmohan Singh, the then Union finance minister. Today the bank is offering different types of banking services throughout the country. To provide better services to its customers, the bank appoints relationship managers. This makes the bank as one of the top private banks in India. With the help of new technology, the bank continuously upgrading its support system. The retail banking service is the main business of the bank. These cards provide you with imbursement comfort that customers always desire from the bank. Now if you apply for the credit card and don't get any information about your application status, you may check application status online. 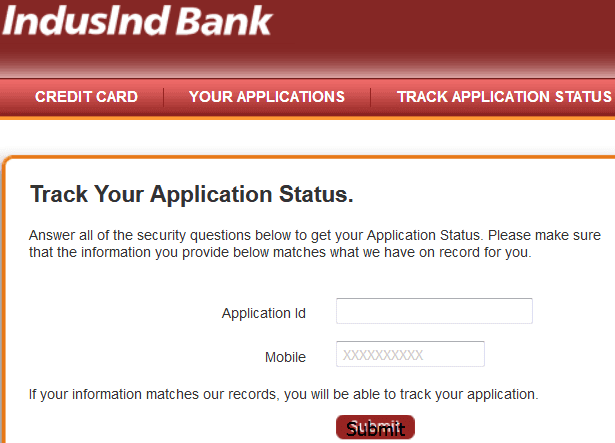 Step 1: Go to the bank's official IndusInd credit card application tracking page https://creditcards.indusind.com/verifyOwnershipForm.html. Step 2: You will be redirected a page that tells you to enter your 'application ID' and 'mobile number'. Step 3: After inputting all the data click on the 'submit' Button. The website will display your credit card application status. Note: You can also call any representative of the bank or may visit the branch physically to verify the status. But the online system is the best method and more convenient and quick method for checking the status. I don't receive my Credit Card till date & the process of IndusInd Bank is really so poor.